Enchanted Lion Books, 9781592701964, 40pp. 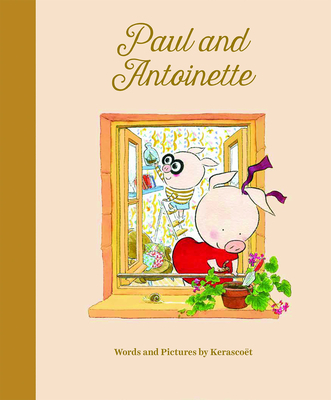 We have seen a few great odd couples in picture books already, but filled with possibility as the world is, there's always room for one more pair, especially if they are as charming and unforgettable as these pigs, born from the brushes and prolific imagination of Kerasco t.
Kerasco t lives and works in Paris in the worlds of cartooning and illustration. Best known for illustrating the book Miss Don't Touch Me written by Hubert, as well as a couple of the Lewis Trondheim Dungeon books, their most recent book Beautiful Darkness broke out on the US scene in 2014, winning them wide recognition and high praise. It was a Publishers Weekly best book of the year.